Our partners at the Oregon Council on Developmental Disabilities invite you post pictures, videos and stories of valued community members, with and without disabilities, on social media to showcase the diversity and strength that exists throughout Oregon. Include the hashtag of #BetterTogether19 with a caption in the spirit of being better together. We are reaching the point in the legislative session where bills that aren't getting scheduled for public hearings or work sessions will begin to "die" in committee. Although it is Spring Break for many folks in the state, it will be business as usual at the Capitol and we are expecting it to be a very busy week! * Note: These deadlines do not apply to the Joint Committee on Ways and Means, other joint committees, the Senate Committee on Finance and Revenue, House Committee on Revenue, and the Senate and House Committees on Rules. Bills that are assigned to these committees can be acted on until the end of the session. Oregon is strongest when everyone has what they need to fully participate in community life. Pay Direct Support Professionals Living Wages - Support rate restructure to reduce turnover and create a living wage for Direct Support Professionals. Fully Fund DD Case Management - Ensure DD Case Managers are fully funded to support people with DD to create plans and achieve their goals. Protect the Fairview Trust - Safeguard the $6 million in the Fairview Housing Trust by moving the funds to the Oregon Community Foundation to ensure it will be available in the future for the development of affordable, accessible and innovative housing options for people with I/DD and their families. Invest in Families - Protect $1.2 million in existing funding for Family Networks connecting families experiencing disabilities and communities. Add $330,000 to build capacity across the state by sustaining new networks in Eastern Oregon. Develop Statewide Data Systems - Establish an integrated information technology system to support case management and provide statewide data to inform policy-making and report life quality outcomes for Oregonians with I/DD. Access the Coalition's 2019 Priorities Page here. Send a Message of Support for DD Services Funding! The Joint Committee on Ways and Means is interested in hearing from Oregonians about their priorities as it relates to the 2019-21 state budget. P lease email waysandmeans.budget@oregonlegislature.gov to send a message to the Ways and Means Committee about why DD Services are important to you and ask for their continued support! Include relevant information from the Coalition Priorities outlined above in your request and be sure to mention your name and city of residence. Our next Advocacy Day will be April 30th at the State of Oregon Public Library across the street from the Capitol. ﻿ The Oregon Developmental Disability Coalition’s GO! Project Advocacy Team will be available from 10 AM to 2 PM to provide information and support. Join us for free legislative advocacy training from 11 AM to Noon. Before the Advocacy Day - Visit www.oregonlegislature.gov to get contact information for your State Senator, State Representative and members of the Joint Ways and Means Human Services Committee, then schedule visits with these key legislators and/or their staff. On the Advocacy Day - Wear something yellow to show unity in advocacy then stop by our Advocacy Headquarters at the State of Oregon Library before and after your visits for important advocacy updates and to complete our GO Project Survey. The following are the hearings for the upcoming week on important budget or policy bills we’re tracking. You can access an updated DD Coalition Priority Bills Report here to stay updated. • 1:00 pm / HR B: Senate Committee on Education will be holding a work session on SB 456 , a bill that prohibits the State Board of Education, school district or public charter school from requiring students to pass a test to demonstrate proficiency in Essential Learning Skills in order to receive a diploma. o Possible work session on HB 2302 , a bill that that appropriates moneys from the General Fund to the Department of Human Services to administer the general assistance project. o Possible work session on HB 3000 , a bill that directs the Department of Human Services to deduct expenses for medically necessary guardianship services from the recipient's income when calculating eligibility for assistance provided by Oregon Supplemental Income Program. o Work session on HB 2327 , a bill that establishes a Statewide School Safety and Prevention System. o Public hearing on HB 2676 , a bill that raises the cap for additional State School Fund monies for students eligible for special education from 11% to 13%. o Public hearing on HJM 3 , a joint memorial that urges Congress to fully fund the federal Individuals with Disabilities Education Act (IDEA). • 3:00 pm / HR F: Joint Committee on Transportation will be holding a p ublic hearing on HB 2915 , a bill that directs the Department of Transportation to establish the Oregon Yellow Dot Program. o Public hearing on HB 2644 , a bill that directs the Youth Development Division to administer a pilot program to coordinate delivery of youth development services through Youth Development Hubs. o Possible work session on HB 3122 , a bill that requires the Department of Human Services to request a specified amount of general fund monies for distribution to centers for independent living. o Public hearing on HB 3206 , a bill that requires the Department of Human Services to administer a program to make support service providers available to individuals who are deaf-blind. o Public hearing on HB 3031 , a bill that creates a family and medical leave insurance program to provide employee who is eligible for coverage with a portion of their wages while the employee is on family and medical leave or military family leave. o Public hearing on SB 947 , a bill that expands the definition of “family member” for purposes of family and medical leave. • 8:00 am / HR D: Senate Committee on Workforce will be holding a public hearing and work session on SB 494 , a bill that requires employers who are authorized to pay subminimum wages to individuals with disabilities to pay certain wage rates until June 30, 2023.
o Public hearing on SB 669 , a bill that modifies the requirements for licensing of in-home care agencies. o Work session on SB 917 , a bill prohibiting employers of certain care providers from interfering with disclosure of information by prospective employees, employees and volunteers about treatment of individuals in care to regulatory agencies, law enforcement or persons acting on behalf of the individual. o Work session on SB 745 , a bill that directs the Department of Human Services to conduct an annual in-person case planning with a ward 14 years of age or older re transition services. o Possible work sessions on SB 1 (establishes a Statewide System of Care Task Force) and SB 221 (directs the Department of Human Services to conduct a study about children and youth with specialized needs and to report results to the legislature). o Work session on SB 274 , a bill that expands eligibility for support service brokerage services to individuals who are 14 to 17 years of age. o Work session on SB 19 , a bill that requires the Department of Human Services and the Oregon Health Authority to adopt rules for licensing each type of adult foster home. o Work session on SB 491 , a bill that transfers from the Department of Human Services to the Oregon Community Foundation responsibility for administering the Fairview Housing Trust. o Work session on SB 475 , a bill that directs the Department of Human Services to conduct monthly, in-person visits with a child or ward in substitute care that include updates on academic status and progress. o Work session on SB 20 , a bill that consolidates eligibility for services to children and adults with developmental disabilities. • 3:00 pm / HR E: House Committee on Health Care will be holding a public hearing on HB 3165 , a bill that requires the Oregon Health Authority to provide planning grants to 10 school districts or education service districts to evaluate community needs for school-based health services. o Public hearing on SB 891 , a bill that requires that a court hold a hearing on a petition to appoint a fiduciary filed by the Oregon Public Guardian and Conservator or county public guardian and conservator. o Work session on SB 682 , a bill that requires a court, under certain circumstances, to appoint legal counsel for a respondent or protected person in a protective proceeding. o Work session on SB 681 , a bill that prescribes an optional form for a supported decision-making agreement. o Work session on SB 376 , a bill that directs a guardian to deliver notice of an order of appointment to certain persons. o Work session on SB 725 , a bill that specifies charges or convictions that may not be considered in fitness determinations. o Public hearing on SB 692 , a bill that directs the Youth Development Division to develop and administer a statewide youth reengagement system. o Public hearing on SB 801 , a bill that authorizes public schools to provide a firearm safety and accident prevention class to all students in the first grade. o Work session on SB 739 , a bill relating to partnerships to improve high school graduation rates. • 1:00 pm / HR A: Senate Committee on Health Care will be holding a public hearing and possible work session on SB 588 , a bill that establishes an Outdoor Therapy grant Program within the State Parks and Recreation Department. • 1:00 pm / HR 50: House Committee on Human Services and Housing will be holding a public hearing on HB 2969 , a bill that creates a trauma practice integration program in the Governor’s office to provide assistance to state agencies and private entities in providing trauma-informed services to children and adolescents. • 1:00 pm / HR C: Senate Committee on Rules will be holding a public hearing on SJR 22 , a joint resolution that proposes amending the Oregon Constitution to lower the voting age from 18 to 16.
o Public hearing on HB 2902 , a bill that requires a school district to report on the number of incidents during which students were removed from the classroom because another student in the classroom was acting in a manner that would threaten or injury other persons or cause damage to school property. o Work session on HB 2989 , a bill that allows students enrolled in GED program to participate in interscholastic activities. o Work session on HB 2214 , a bill that appropriates money to fund Oregon’s Open Educational Resources (OER) Program. o Public hearing and possible work session on HJR 15 , a joint resolution that directs state agencies to follow Childhood and Early Parenting Principles as a framework for policies and programs for early parenting and early childhood development. o Public hearing and possible work session on HB 2939 , a bill that directs the Youth Development Division to develop and administer a statewide youth reengagement system. • 5:00 pm / HR F: Joint Committee on Transportation will be holding a work session on HB 2219 , a bill that creates a task force on extending the Westside Express Service Commuter Line to Salem. • 8:00 am / HR D: Senate Committee on Workforce will be holding a work session on SB 494 , a bill that requires employers who are authorized to pay subminimum wages to individuals with disabilities to pay certain wage rates until June 30, 2023.
o Work session on SB 493 , a bill that establishes the Oregon Human Rights Commission to safeguard the dignity and basic human rights of individuals with intellectual or developmental disabilities. o Work session on SB 669 , a bill that modifies the requirements for licensing of in-home care agencies. o Public hearing on HB 3262 , a bill that imposes an assessment on large employers with employees who receive or who have minor children who receive certain types of public assistance in this state, in an amount equal to public assistance paid. o Work session on HB 3165 , a bill that requires the Oregon Health Authority to provide planning grants to 10 school districts or education service districts to evaluate community needs for school-based health services. INTERESTED IN TRACKING BILLS OR HEARINGS? 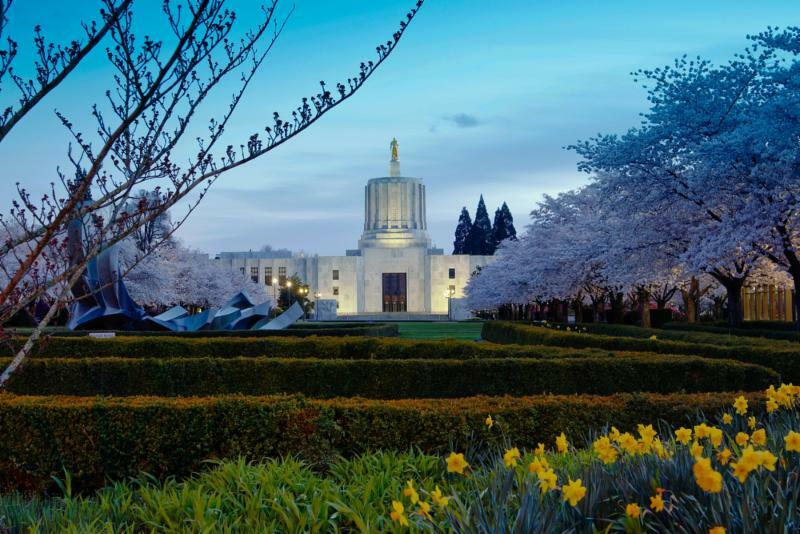 • Use the Oregon Legislature's Capitol e-Subscribe service to receive bill alerts for individual bills as they move through the legislative process, receive committee agendas, news from members of the legislative body and more. • You can also watch or listen to live or archived video and audio of Oregon Senate and House chamber sessions and Committee hearings. 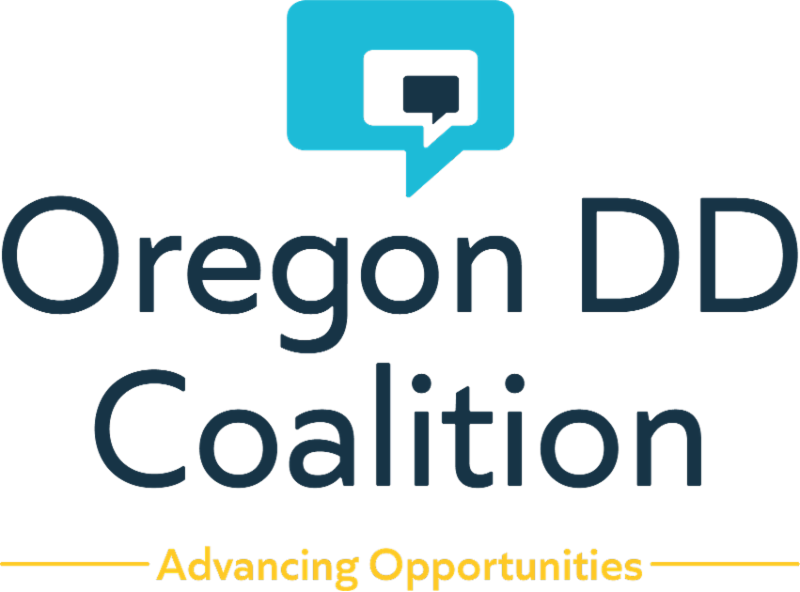 The Oregon DD Coalition advocates for DD services on behalf of and with people with intellectual and developmental disabilities, their families, and support organizations in Oregon. We influence DD service and community support systems and legislation by communicating with a common, consistent voice – creating better opportunities for Oregonians with intellectual and developmental disabilities. becoming a member of the Oregon DD Coalition?